One last Christmas project for this year. I've made a new large Christmas wreath. 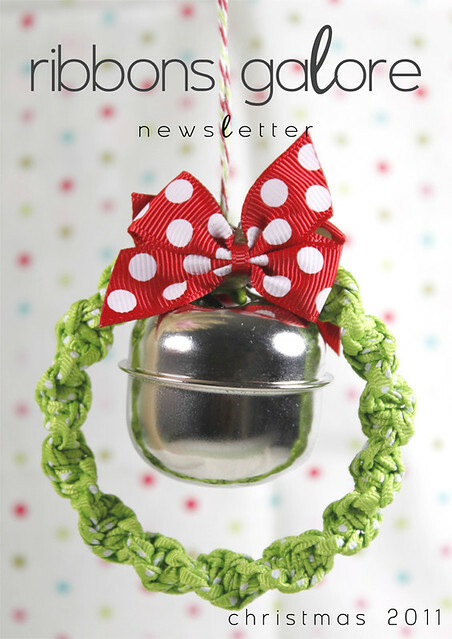 This large wreath has ribbon knotted around the large metal ring. With large jingle bells hung down in the middle of the wreath. To my blog readers and Ribbons Galore customers, I wish you a merry Christmas and a safe, happy and healthy 2012. I've received a few questions about the Christmas wreaths I made in my last post. Here's a few instructions, hope they help. Edited in 2014... If you would like to make some of these weaths, I have kits available. They have the supplies to make 3 wreaths (3 rings, jingle bells, ribbon, bows and baker's twine). All you will need is the hot glue gun or other adhesive to attach the bows. The kits are available at Ribbons Galore. Start with knotting the ribbon around the ring like below. Halve the length of ribbon and place under the ring, bring the left side over the ring, the right side over the left ribbon and under the ring and through. Tie each knot firmly. Then keep knotting around the ring as above. If you know macrame knots this one is the half square knot which gives the twisted effect, BUT you must keep the knots exactly the same all the way round. Hope you enjoy making these :) Ribbons and bows are from Ribbons Galore (www.ribbonsgalore.com.au). Edited in 2013... If you would like to make some of these weaths, I have kits available. They have the supplies to make 3 wreaths (3 rings, jingle bells, ribbon, bows and baker's twine). All you will need is the hot glue gun or other adhesive to attach the bows. The kits are available at Ribbons Galore. I've been making more Christmas decorations, this time, mini Christmas wreaths. They are similar to mini macrame Christmas wreaths I used to make as a kid, I've just used grosgrain ribbon instead of macrame cord. I've tied grosgrain ribbon around a metal ring using a half square knots, and added large jingle bells and grosgrain bows to embellish the mini wreaths. And I've used a short length of bakers twine to hang each of them up. I sold my first hand made items at the age of 10 to a gift shop in Mudgee. These hand made items were all little macrame Christmas decorations. One of the decorations was very similar to these modern-day ribbon macrame Christmas wreaths. These are very easy to make... a great Christmas activity for the kids too. Edited in 2012... If you would like to make some of these weaths, I have kits available. They have the supplies to make 3 wreaths (3 rings, jingle bells, ribbon, bows and baker's twine). All you will need is the hot glue gun or other adhesive to attach the bows. The kits are available at Ribbons Galore. There's a traditional Danish Christmas craft of making flettede stjerner from paper. These stars make such beautiful Christmas decorations and are made at Christmas time by children and adults. When I saw them I thought they'd look pretty made from ribbon, so I set about translating instructions, cutting and folding ribbon as you would the traditionally used paper. I found through trial and error that you need to use a stiff or firm ribbon, rather than the softer ribbons. The striped grosgrain I have at Ribbons Galore worked perfectly. When I'd finished folding the stars, I ironed the edges lightly to hold the ribbon in place. You could also use a little fusible webbing inside the folded edges to hold the ribbon. I then threaded bakers twine through the stars so they could hand on the tree. Flettede stjerner, this is the instruction sheet I used, it in a pdf format. Sofie Legarth shares how to make fabric flettet stjerne in her blog post. Hope you enjoy making some yourself for Christmas.